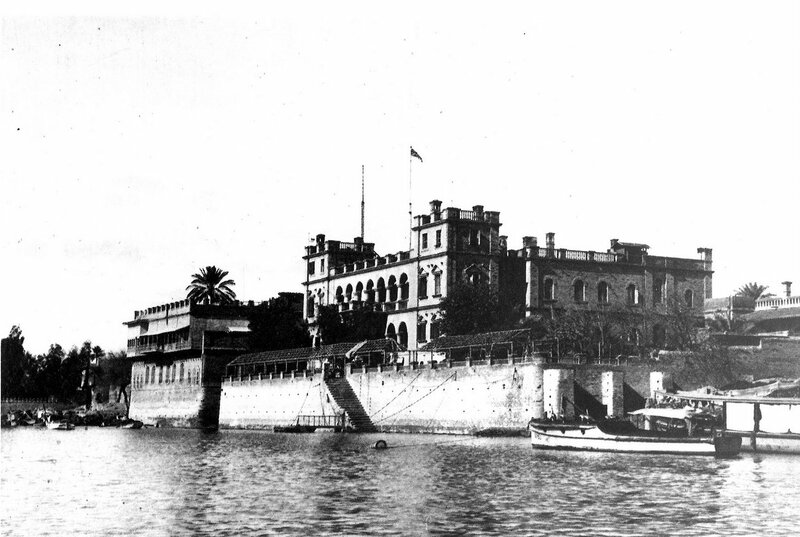 The third residency, the Nawab’s own former property, was eventually bought for 36,000 rupees in 1900, in the name of the British embassy at Constantinople. It comprised three acres on the same, east, river bank, provided a good anchorage for the residency steamer, the Comet, and offered opportunities to build a fine new house on the site of the Nawab’s old house, and to convert outbuildings for ancillary purposes. Designs for the development of the site for residence, offices, hospital, barracks, post office and all supporting facilities were quickly produced [? who by] and a contract was let in 1902 to Messrs BR Herman & Co of Karachi for their construction, at about 325,000 rupees. All the buildings were occupied before the end of 1905 (when the second residency was vacated). 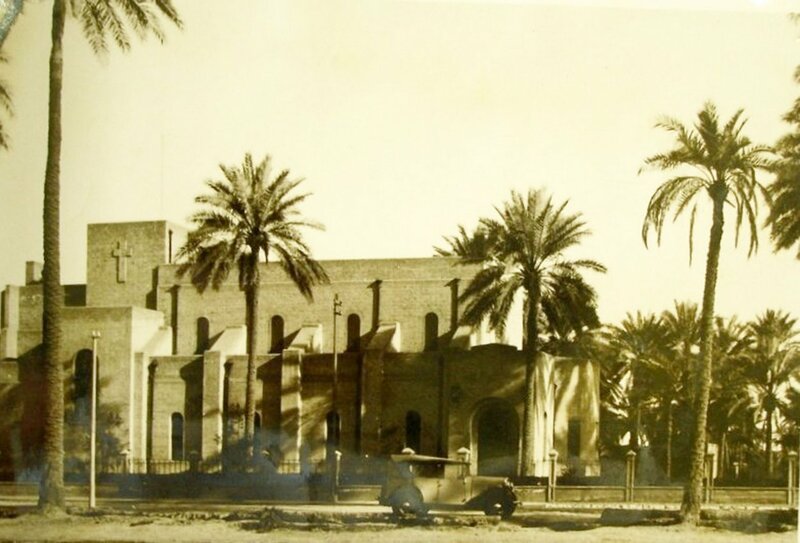 The new residency proved to be the grandest in Baghdad: Gertrude Bell rejoiced in staying there in 1911, not least ‘the roses and green lawns’ of the garden. Third residency (photo believed taken by Gertrude Bell, 1911). 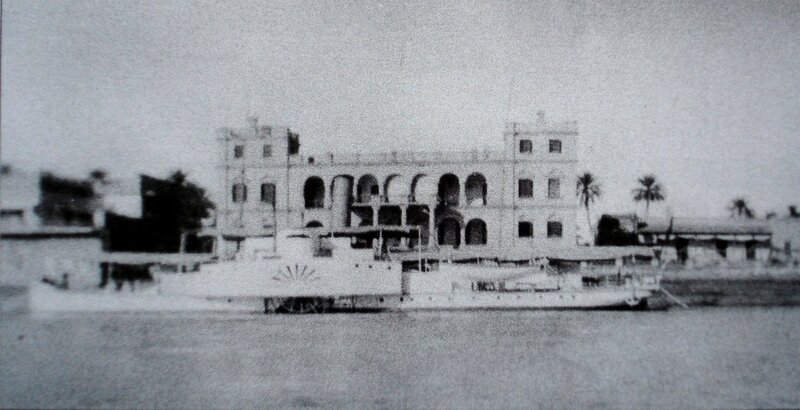 Third residency, with its yacht, 1911. (by kind permission of Gertrude Bell Archive, Newcastle University, image Q038). 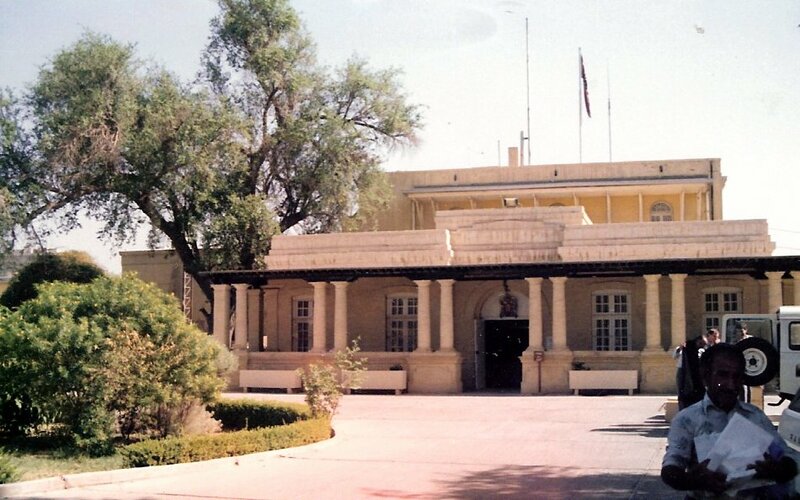 Front (reduced in height) of former High Commission, 1988 (by courtesy of Sir Terence Clark). In 1920, Britain was given a mandate by the League of Nations to govern Mesopotamia. Responsibility for doing so was transferred from the India Office to the Colonial Office, and Cox was appointed High Commissioner. The Amir Faisal became king of Iraq in July 1921. Britain’s mandate expired in 1932 and Iraq became an independent country. The High Commission site became Britain’s new embassy and the Office of Works took over responsibility for the property. The compound was enlarged in 1932 by the purchase of just under two acres to regularise the north-west boundary and remove some Arab tenements. 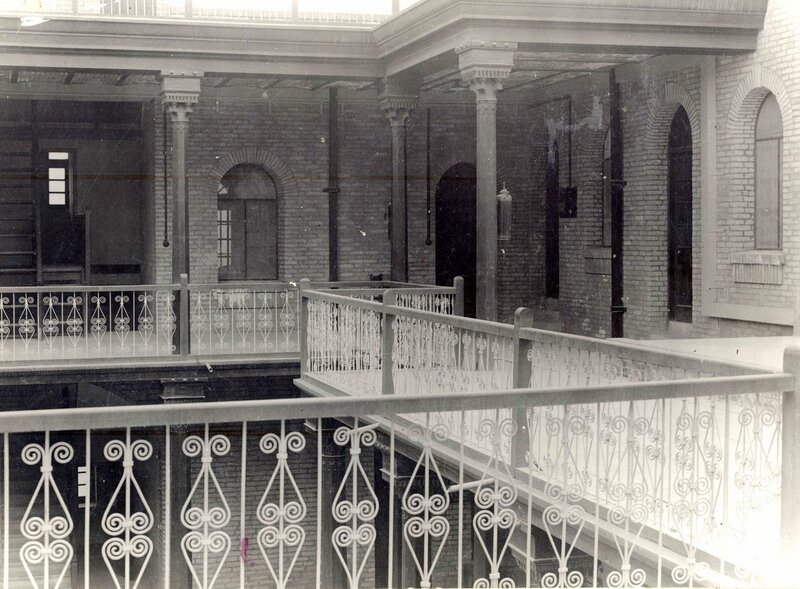 The office building was extensively reconstructed in 1935, and the swimming pool was built in 1944. The Second World War started with Britain and Iraq as allies but events gradually drove them apart. 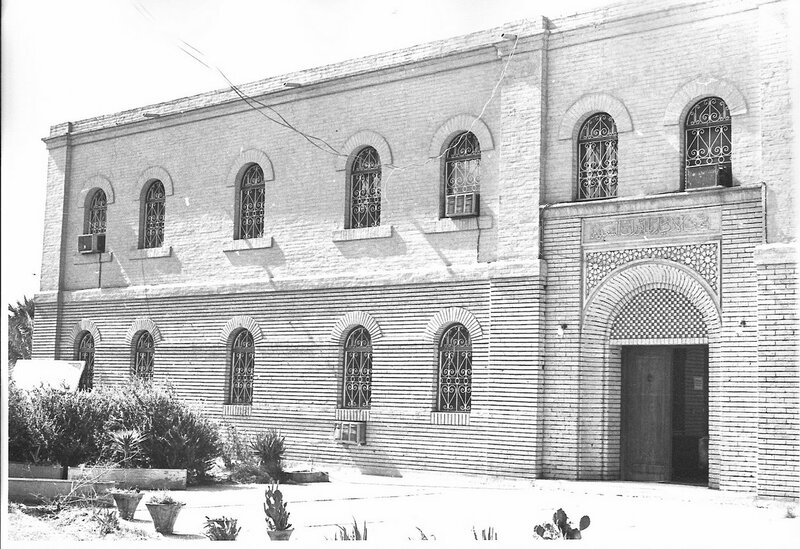 The low point was reached when four hundred or so British and a few other civilians had to take refuge in the embassy compound throughout May 1941. There were numerous proposals and discussions during the next ten years about new embassy buildings. Most ambassadors disliked the 1922 residence, not least because it was now the wrong way round: the house was designed for arrival by launch and entry on the river side, whereas arrival later became mostly by car and through the back door. 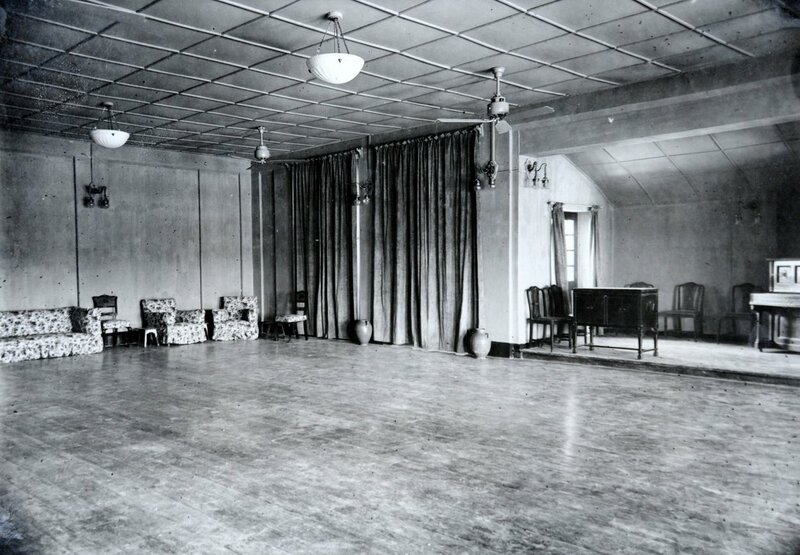 The addition of the ballroom, billiards room and so-called Palm Court in [?when] had also left many of the rooms too dark. 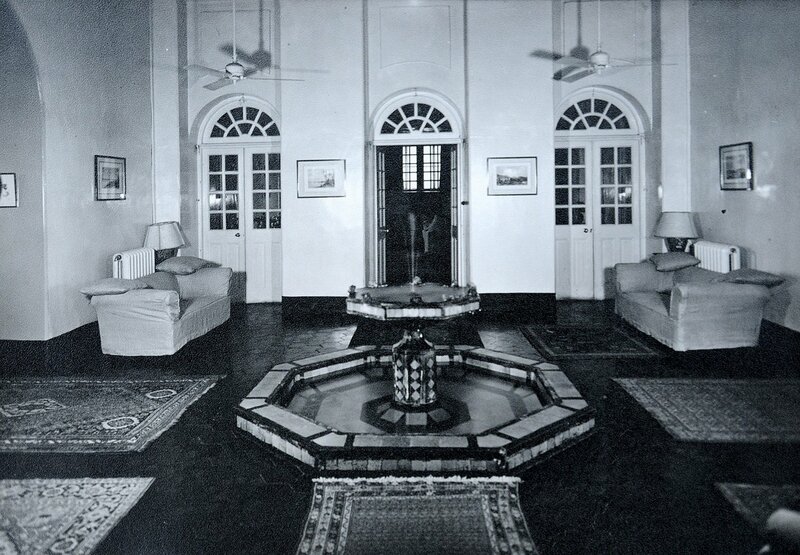 The ambassador in 1946, Hugh Stonehewer-Bird, favoured extensive rebuilding of the residence and offices around the existing buildings while they remained in use. Kenneth Judd, the Ministry of Works architect in Cairo, produced a scheme later that year but it was too awful to find any favour. JM Wilson, of Wilson and Mason Partners, private architects of 3 Chandos Place, London W1, was brought in to do better. He proposed a new residence at the north end of the riverbank and a three [?] storey curved office building at the other side of the site, facing a road circus (and moving the statue of General Maude to the centre of the circus). No scheme came to anything, mainly because the Baghdad embassy could not command sufficient priority to justify the capital expenditure. The offices therefore remained over-crowded and outmoded, and overspill space was provided by some of the outbuildings and by renting premises elsewhere for the consulate and other public sections. Site plan of Tigris compound (north to top left)), with offices top right and residence to its left, 1947? 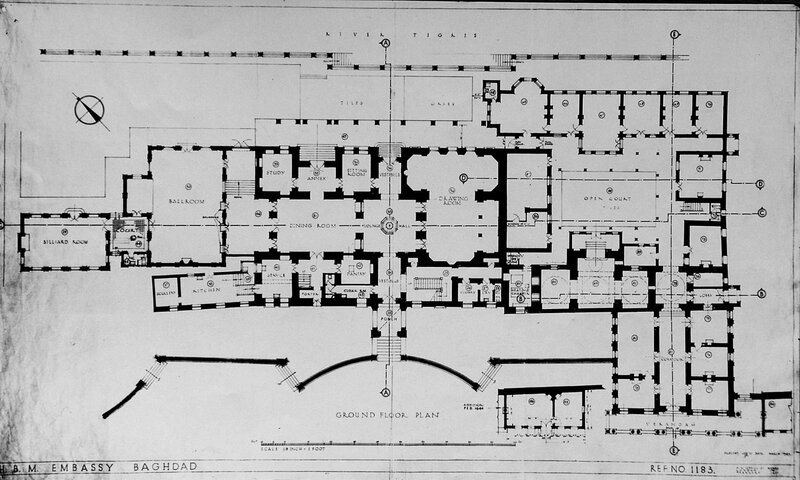 Ground floor plan of offices and residence), 1949. 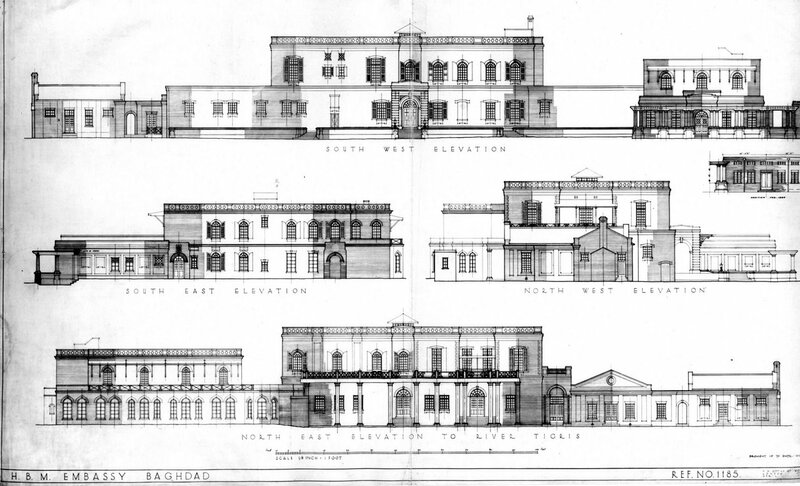 Elevation drawings of main compound buildings, 1949. Top, from compound: bottom, from river. 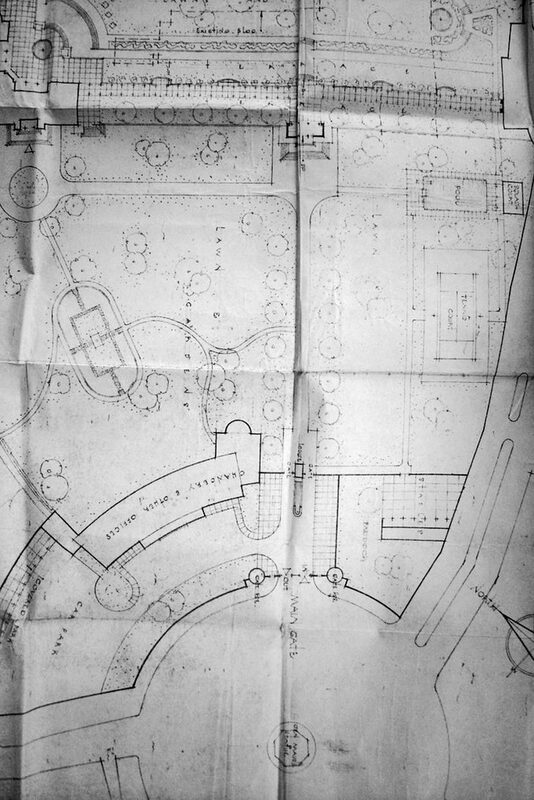 Wilson and Mason’s proposal for re-arranging Tigris Compound, 1947. Entrance front to offices (with old two-storey building behind(, 1988 (by courtesy of Sir Terence Clark). 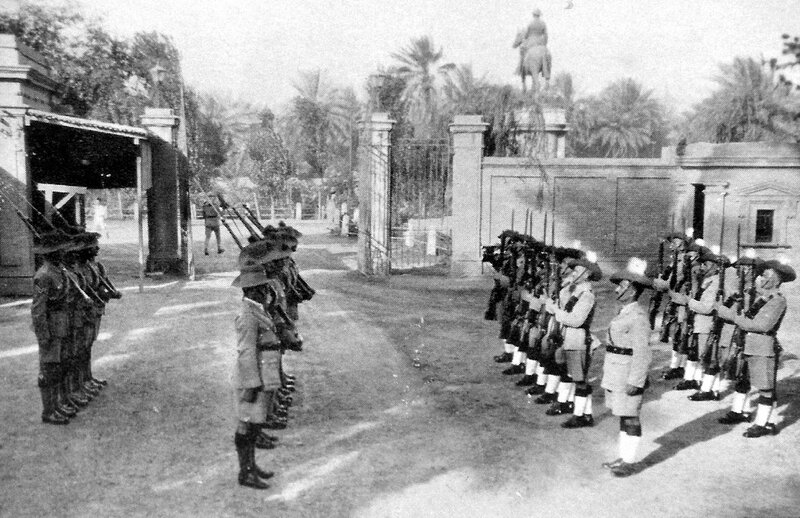 Gurkha guard inside the compound gates, with equestrian statue of Gen. Maude outside, 1940s (by courtesy of E Fraser). Upper level of office courtyard, ? date. The termination of the mandate in 1932 enabled an entirely separate property deal to be done, though it turned into a tortured transaction. 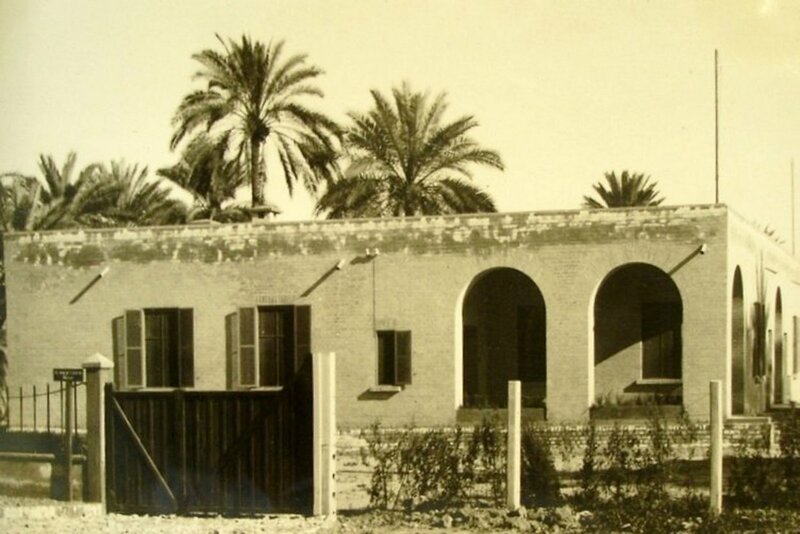 In 1920, the British government had bought, as part of its holdings in the Iraqi railways, a 24 acre site in West Baghdad, at Sharia el Mansour, about half a mile due south of the embassy. In 1932, it asked for this site to be withdrawn from railway assets, so as to be available for future embassy use. The freehold was accordingly transferred and registered in 1933, though doubts about the validity of the transaction lingered on until finally cleared in 1949. 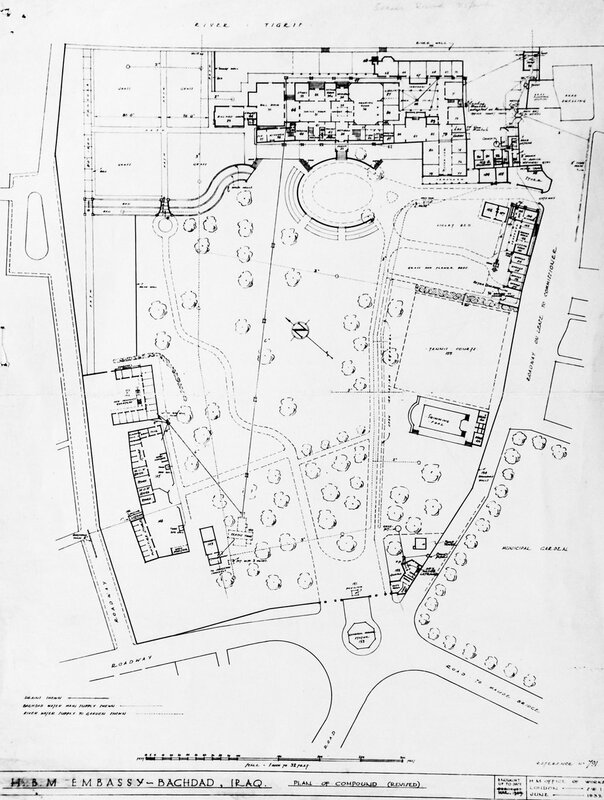 The embassy was keen to make good use of the site quickly and in 1934 proposed that thirteen staff houses should be built on it but the Office of Works turned them down as uneconomic. In 1937, the Treasury rejected a case for building just a single counsellor’s house. In the event, only St George’s church and a vicarage were built before the Second World War, in 1936 and 1939 respectively, on a sub-leased part of the site at the north corner. After Britain re-occupied Iraq in 1941, its armed forces used the West Bank site (by then, often referred to as the Church site) as a rest camp until 1947. In 1948, Wilson and Mason Partners superseded another poor Cairo design for about twenty houses and as many flats for the West site. The Treasury did at one stage give approval for thirty flats at the site but more detailed work showed that they would be uneconomic compared to current rental rates. There was, however, one positive event at this site: in late-1954, it was the venue for a large trade fair organised by the Federation of British Industries. 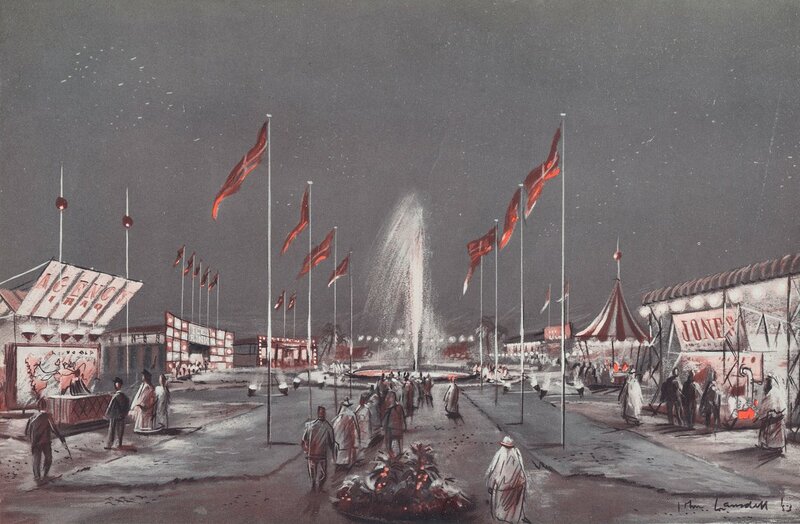 Artist’s impression in the British Trade Fair prospectus, 1954.